This summer marked the 20th anniversary of the Girl Power explosion of 1996, when five unstoppable Brits took over the world. And while fans dusted off their copies of Spice World, argued over who was still a Posh or a Scary, and showed off their ability to rattle off the "Wannabe" rap ("So, here’s a story from A to Z …"), one Berlin-based creative decided to prove fandom never ends by commissioning a full exhibit of Spice Girls-influenced pieces. For five days at The Ballery, a Berlin art space and community gallery, curator Nadir Catalano sought to turn the space into “a collective teen bedroom” of pieces dedicated to the Fab Five. Before commissioning pieces, he considered various directions the exhibition might take. "Should it be a celebration of Girl Power? About the female role in the media? About the '90s aesthetic?" Catalano told mental_floss about his thought process. "But I decided that the only way to do it was to create a celebration for people who were teenagers and fans of the Spice Girls in the '90s. Because no matter what you are doing now, if you were a '90s kid, the Spice Girls had an undeniable influence on you." The idea for this Spice Girls-centered show started on a whim. Catalano and The Ballery's founder and managing director Simon Williams—who is British—were having drinks in February and discussing their shared love of the group. "I thought it was just a joke," Catalano said of their impromptu planning session, "then after a couple of weeks he wrote me, giving me the dates for the exhibition." Catalano asked the artists to "jump back in time, go into their teenage bedroom" and remember who they were then and how that has influenced who they've become. One artist, Federica Masini, took a turn on the opening "Wannabe" lyrics, calling her set of five portraits "If You Want My Future, Forget My (Punk) Past" and reimagining each of the women as punk goddesses, sporting Ramones and New York Dolls tees. Other pieces include artist Rory Midhani's highly Instagrammable, two-wall sketch-drawing of a bedroom covered in Spice Girls posters and memorabilia (complete with cutout Pepsi can and cassette tape props to pose with), and a set of illustrated variations on Baby Spice by Mi Nator, featuring copious amounts of glitter and Lisa Frank stickers. 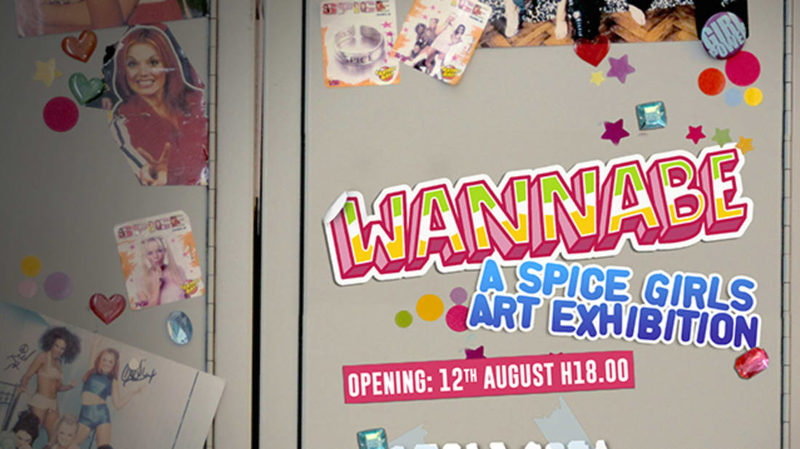 The Berlin show, "Wannabe 1996-2016: A Spice Girls Art Exhibition" runs through August 16, though Catalano says that he would love to expand it and take the show to London. We think that's something the UK would really, really want.